August | 2014 | Alveston & Tiddington Allotments & Gardens Assoc. Are you running out of space for fruit and veg in your garden at home? Or maybe you live in a flat and don’t have a garden at all? That’s when having an allotment plot can come in handy. Its a space for you to grow cheap, healthy food whilst getting some quality “outdoors time” and exercise. 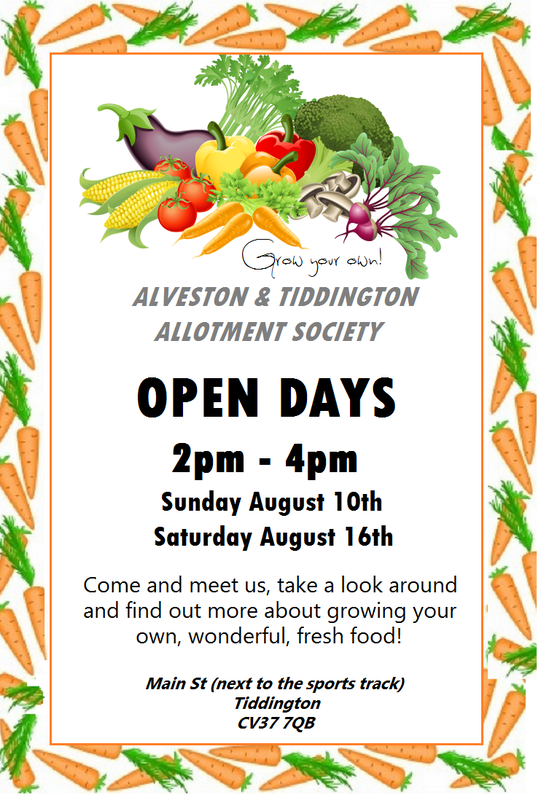 At the Alveston & Tiddington allotment site just outside Stratford-upon-Avon we’re having two “open day” afternoons from 2pm – 4pm on Sunday 10th August and Saturday 16th August. You can come along on either day and talk to existing plot holders about the pro’s and con’s of having an allotment plot, see what our site is like and then put your name down to go on our waiting list for plots. We’re doing the two open day afternoons in August as we re-issue the plot leases in September. There’s always a few people who no longer need their plots so getting on the waiting list now is a good time to minimize the wait for a plot. So come on down to the site and sign up to get growing!